It’s common knowledge that Dr. Pepper is the very best “coke” around and that it’s generously consumed in the Sangree household. =) In fact, when we lived in Australia, we actually got the local grocery store to import a pallet of it for us (and our friends). Anyway, I couldn’t resist snapping this shot (with my cell phone) of a super-sized can of Dr. Pepper that Holly’s brother Levi picked up in Puerto Vallarta recently. I think it was a 20 oz. can with the old “10, 2 & 4” slogan on it and it was sweetened with pure cane sugar. 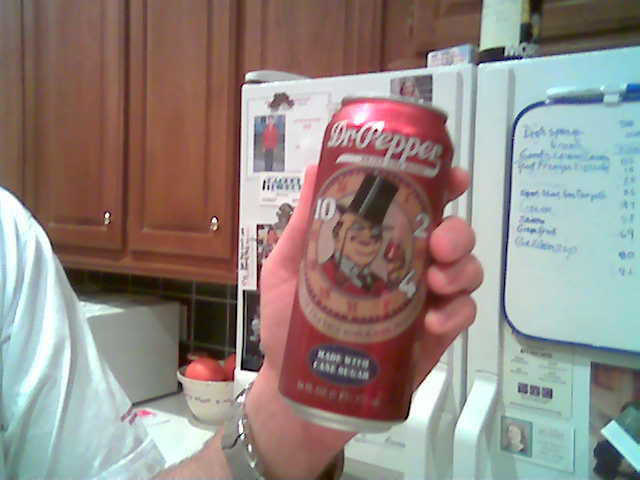 It didn’t taste any different than regular US Dr. Pepper, in my opinion. While I’m completely off of the subject of photography, I thought I’d post an amazing video I saw recently of an elephant-back tiger-spotting safari. You’ve got to check this out. I wish it continued to show what happens at the end, but all you see are the elephants running away. Pretty amazing! Hope you’re enjoying your weekend! If anyone buys any wedding apparel tax-free this weekend I’d love to hear about it!